Today we are going to talk about mom jeans outfit ideas to try this year. I think everyone is familiar with this kind of denim bottoms. They do look practical and very easy to wear. I hear many women don’t know how to wear these jeans in real life, that’s why I decided to create a blog post by showing you best ways how to make these bottoms look awesome on you. Believe it or not, but you can create as much looks out of them as from skinnies. Blue mom cuffed jeans are styled with band jacket in cream white color. 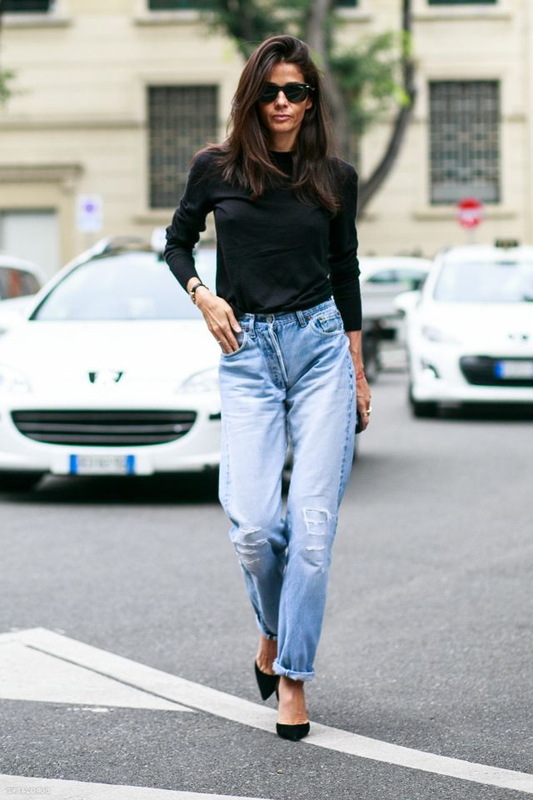 Of course, you might say mom jeans are having their moment thanks to normcore movement, but I think it’s all about 1990’s vibe and comfortable fit. You are free to pair them with crop tops, tucked in blouses, blazers, pullovers, sweaters, etc. Plus, you can style them with about any shoe style, starting from sneakers to heels. Believe me, you can make these loose fit jeans look really awesome, all you need is to find a perfect balance and fit. Read on to see my favorite outfit ideas to copy now.